The European Union’s trade with the world’s poorest countries remains pitifully low and largely stagnant. Developing countries account for one-seventh of the world’s population, but only one-fortieth of EU imports. The scope for growth is immense, and expanding trade is a win-win tool that will benefit developed and developing countries alike, as the more the poorest countries can export to the bloc, the more these countries will buy from the European Union. Up until now, EU trade policy has not focused enough on international development, and the bloc's development policy has lacked a focus on trade. The EU has taken welcome steps to remove barriers facing poor countries’ exports, but much remains to be done. With a new EU trade commissioner due to take office on Nov. 1 — most likely current Home Affairs Commissioner Cecilia Malmström after her confirmation hearing this week — there's a new opportunity for the European Union to recognize that trade policy is not just about promoting the EU’s direct commercial interests — it can also be a key tool to stimulate economic growth in the developing world. 1. 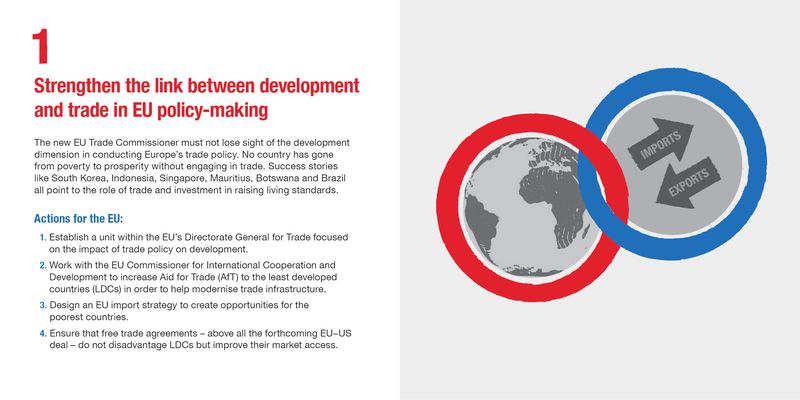 Strengthen the link between development and trade in EU policymaking. No country has gone from poverty to prosperity without engaging in trade. Success stories like South Korea, Indonesia, Botswana and Brazil all point to the role of trade and investment in raising living standards. The EU should establish a unit with the directorate general for trade focused on the impact of trade policy on development. Click here for a large version of the image. 2. 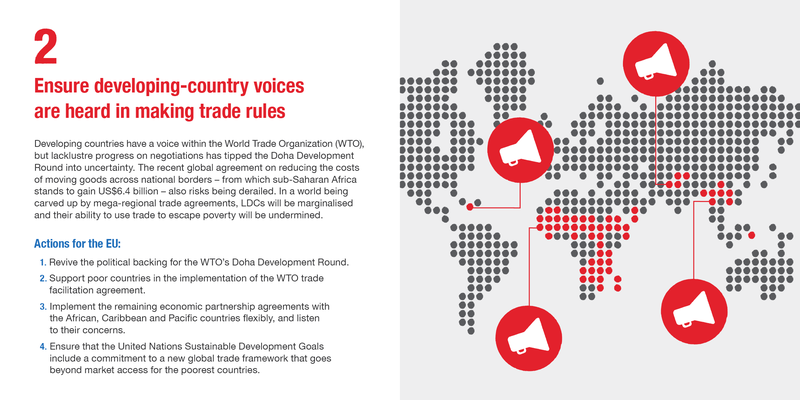 Ensure developing country voices are heard in making trade rules. In a world being carved up by megaregional trade agreements, developing countries risk being marginalized and their ability to use trade to escape poverty undermined. The European Union must ensure that free trade agreements — above all the forthcoming EU-U.S. deal — do not disadvantage developing countries. 3. Diversify trade with developing countries. To trade out of poverty in a sustainable way, exports from developing countries must come from a wider range of sectors and industries in order to facilitate wealth distribution and job creation. Recent growth in exports to the EU has been through oil exports, which doubled in share from 18 percent in 2002 to 35 percent in 2013. 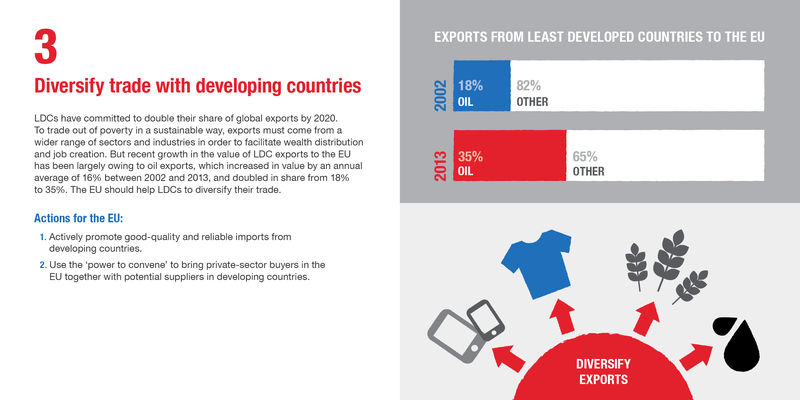 The EU should help developing countries to diversify their trade. 4. Abolish tariff peaks. 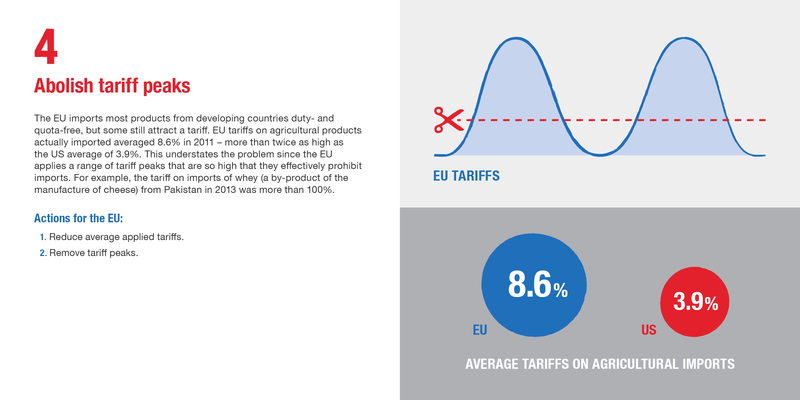 The EU should get rid of tariff peaks, which are sometimes so high they effectively prohibit imports — like when whey imports from Pakistan faced a tariff of more than 100 percent in 2013. 5. Revise rules of origin for 21st century trade. Rules of origin should be updated to reflect the fact that goods are increasingly "made in the world." 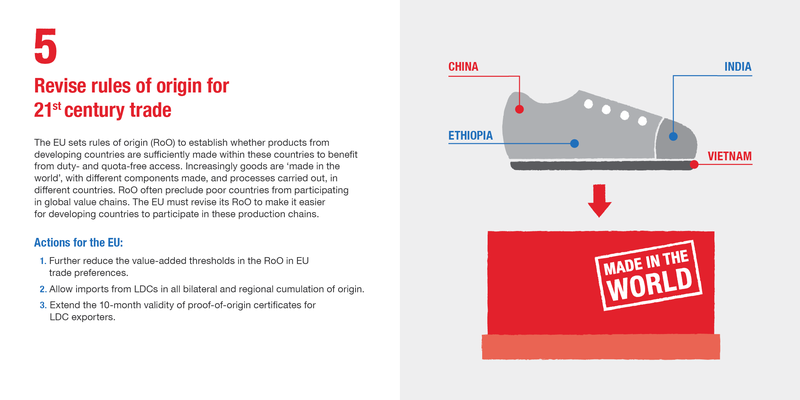 With different components being made — and processes carried out — in different countries, rules of origin often preclude poor countries from participating in global value chains. 6. Protect poor countries from trade defense measures. 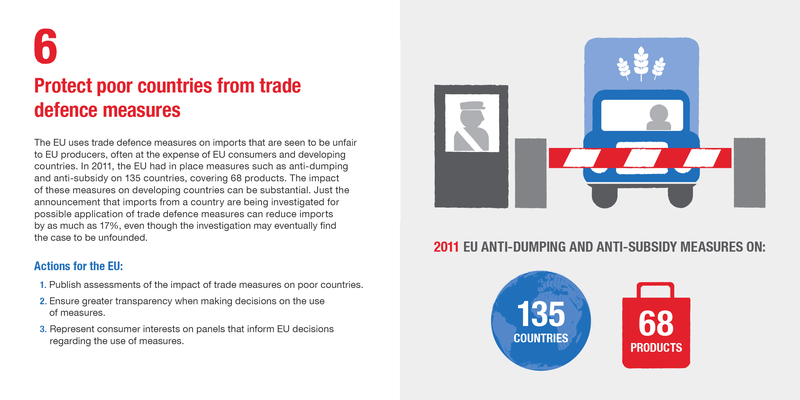 In 2011, the EU had in place measures such as anti-dumping and anti-subsidy on 135 countries, covering 68 products. Just the announcement that imports from a country are being investigated for possible application of trade defense measures can reduce imports by as much as 17 percent. The EU should stop using trade defense measures against poor countries’ imports. 7. Provide a level playing field for agricultural trade. 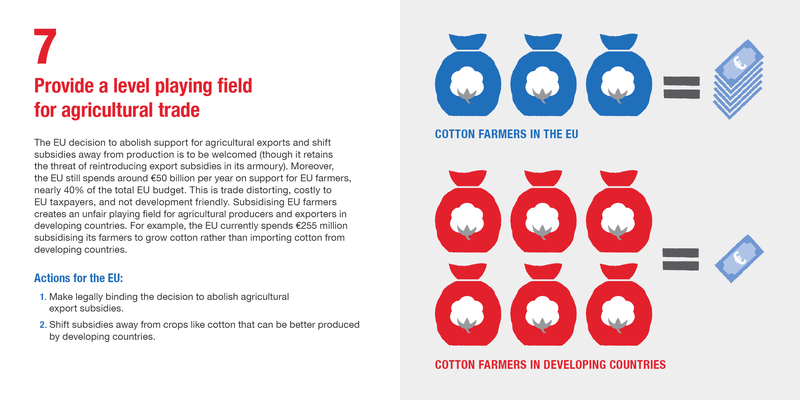 The EU spends around 50 billion euros ($63 billion) a year on support for EU farmers — nearly 40 percent of the bloc's total budget — and is subsidizing its cotton farmers to the tune of 255 million euros a year. The decision to abolish agricultural export subsidies should be made legally binding and a commitment made to shift subsidies away from crops like cotton that can be better produced by developing countries. 8. 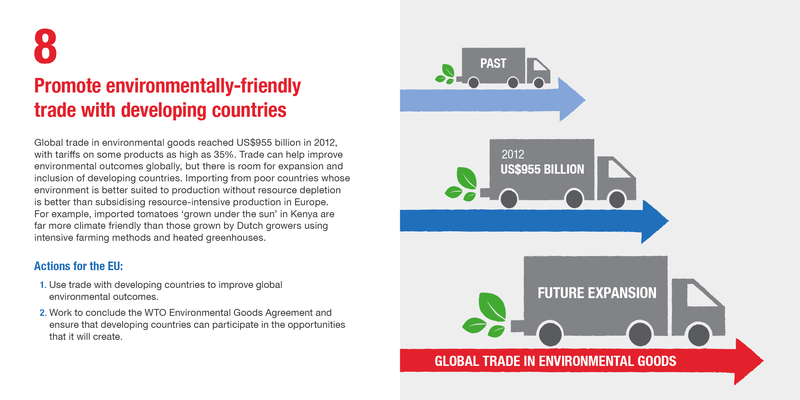 Promote environment-friendly trade with developing countries. Trade can help improve environmental outcomes globally, but there is room for expansion and inclusion of developing countries. Importing from poor countries whose environment is better suited to production without resource depletion is better than subsidizing resource-intensive use of resources production in Europe. 9. 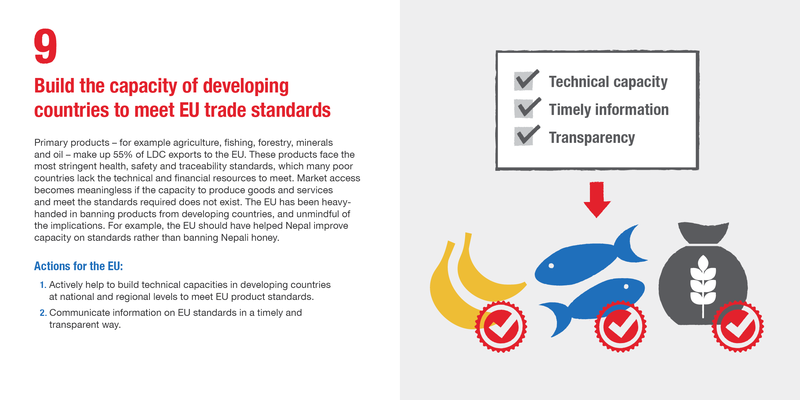 Build the capacity of developing countries to meet EU trade standards. Primary products such as agriculture, fishing, mining and forestry make up 55 percent of developing countries’ exports to the EU. These products face the most stringent health, safety and traceability standards, which many poor countries lack the technical and financial resources to meet. Market access becomes meaningless if the capacity to produce goods and services and meet the standards required is missing. The EU has been heavy-handed in banning products from developing countries and unmindful of the implications. 10. 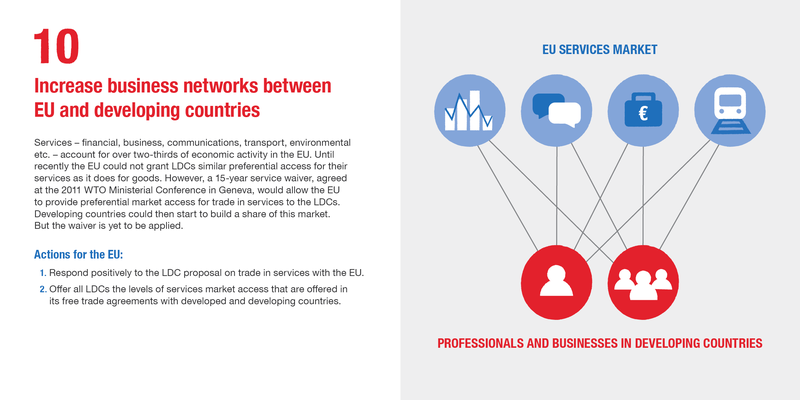 Increase business networks between EU and developing countries. The European Union should provide preferential access to services exports from developing countries. Services account for more than two-thirds of economic activity within the EU. Implementing the waiver that has already been agreed at the World Trade Organization would help developing countries to start to build their share of this market. The new EU trade commissioner must not lose sight of the development dimension in conducting Europe’s trade policy. Trade and development policy are not separate agenda, and a Commission that works in silos makes no sense in a world where poverty, prosperity and trade are so interconnected. No country has gone from poverty to prosperity without engaging in trade, and Europe will prosper if the world is prospering. Peter Lilley is co-chair of Trade Out of Poverty and current British MP. Before being elected to Parliament in 1983, Lilley worked as an economic consultant focused on aid and development programs in Africa and Asia, and chaired the U.K. Conservative Party’s Global Poverty Policy Commission advised by Bob Geldof. He is also a former secretary of state for Trade and Industry. Yurendra Basnett is a development economist specializing in trade and development policies and advising governments, U.N. agencies and donors on aid for trade, WTO negotiations and regional trade agreements. He has worked in Uganda, South Sudan, Sudan, Namibia, Nepal, Vanuatu, Samoa and the Solomon Islands.